Apologies for the posting hiatus! I've been making major adjustments as well as going through personal life changes. Carrying on with life as well as with regular posting schedules. The rare times I find perks in being petite is the ease discovering oversized anythings. As temperatures are finally dropping to what seems winter worthy, I layered a vintage blouse beneath an oversized grandpa sweater. This equestrian print blouse is probably one of the coolest ones I own and I was lucky to discover it on my trip to Haight-Ashbury, which is why I made sure it deemed its presence noteworthy by having it peek out of the sweater. Love your outfit!Been looking for an oxblood sweater for days! Love the look, such a cool vintage top! you look so amazing! i wish i could pull something like this off. Gurl, your blog rocks! I LOVE that vintage equestrian tee...you've got a killer eye. Keep it up, can't wait to see more. hey girl, i nominated you for a liebster award! check out my blog for more details! love this look! i'm def trying this look out now. thanks for the inspiration girl! ah you look fantastic as always girl! So bohemian, this outfit! I love it! I really like your sweater! INSTANT FOLLOW. I love your style! The blouse is just to die for and I love the oversized sweater over it. Lovely. Lovely outfit!I love your hair collor! love your style, and you hair are fabolous!!! Amazing look! I love that you're wearing the shirt as a dress. Love the colour of the sweater - and it suits your colouring perfectly! hi!! amazing blog! i love your style so so cool! i love the oversize sweater with the shirt underneath! i love the combination of those colors of those two is so beautiful! You look amazing! I love your shirt and sweater! love your hair, your photos, and the dress shirt :) following you now! Amazing! I love the knee highs! the layering on this is genius! lovely outfit & cute sweater! merry christmas! I am petite as well, so I definitely find a lot of blouses and sweaters that fit as dresses too.. isn't that great? loving your look,, cool style.. merry xmas! Merry Christmas darling! You look gorgeous! that print is awesome! love the length of the shirt. 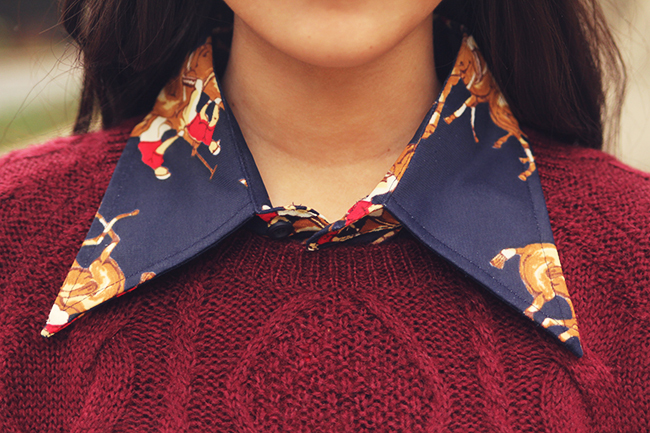 your shirt is beautiful, I love the horse print and it looks amazing with the burgundy sweater! eeep this outfit is gorgeous :) And ahhh I haven't been to Haight-Ashbury for so long but now I realllllly want to. oh gosh you're so pretty! the outfit is fantastic. Your shirt is so cute!! Love your burgundy sweater too. Thanks for visiting me doll. Lovely shirt and jumper!I like your style. What about following each other? I'm in love with this look! I love the sweater and the oversize shirt is perfect. This is just flawless and you look stunning. another good thing about being petite is how lovely those over-the-knees look! you look gorgeous in all of these. being petite is a good thing! You have beautiful pictures girl! i love it, maybe we can follow each other:) ? You look so cute! I love the color of the sweater!